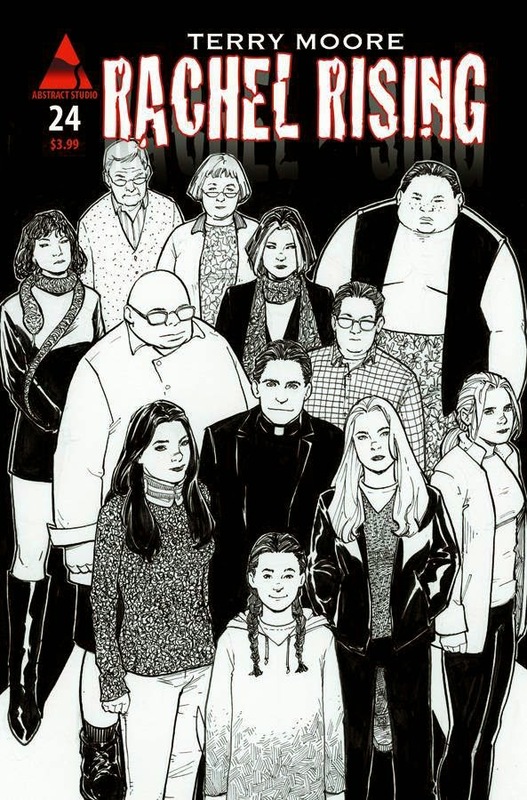 AS MUCH as I disparage Terry Moore's pricing policy for RACHEL RISING, I really want to reiterate how great this series is. I heartily recommend you pick up the first four volumes, which covers the first 24-issue arc. But I wonder how Moore will do now that the driving story of the first arc is now over. In some ways, it reminds me of David Lynch's TWIN PEAKS. The first season was awesome as it revolved around the search for Laura Palmer's killer and all the weirdness that surrounded the case. Once the killer (SPOILER: it was her father under the influence of the otherworldy demon "Bob") was caught, it seemed to take the wind out of the sails of the series. The second season just wasn't very good because there was no real reason for viewers to hang around and watch the general weirdness without a driving major plot being resolved. In RACHEL RISING, the evil of Lilith and Malus was defeated at the end of Volume 4. So now we're left with two undead friends, a sociopathic 50yo woman trapped in the body of a child and a doctor who fucks his wife's corpse at night. That's one step away from the cast of GOLDEN GIRLS! Anyway, Moore has begun a new arc where the Scooby Gang are looking for a friend's murderer, but it all seems forced. I really think the series would have ended perfectly at the end of #24, but Moore clearly wants to milk his cash cow a while longer. It'll be interesting whether he can maintain the quality of the first arc with this run.